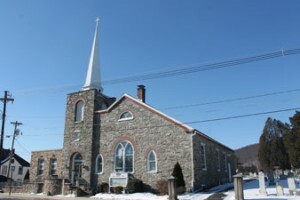 Jacob Weller, Jr., the third generation of the Weller family, in what was Mechanicstown but is now known as Thurmont, donated the ground for the building of a Brethren church and cemetery on Altamount Avenue. The cornerstone of the 40-foot square stone building was placed in October 1830. Jacob Weller, Jr. died in 1831. At the time of his death, Weller’s Church was still unfinished. His grave was the first in the Brethren Church cemetery. The United Brethren in Christ (UBC) congregation was aligned with the disciplines of the Evangelical Church and the two united in 1946 to become the Evangelical United Brethren (EUB). In 1968, the EUB and the Methodist Church joined and what is now Weller Church got its name. In its 185 year history, Weller United Methodist Church continues to serve its congregants, friends and the community.